Product #16877 | SKU BA1711300 | 0.0 (no ratings yet) Thanks for your rating! 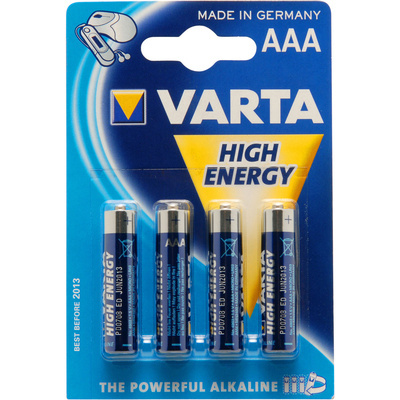 The 4-pack of AAA 1.5V Alkaline Batteries from Varta is a package of standard AAA batteries for use in many small electronics like remotes, toys and radios. These batteries are lead and mercury free. The single-press-out packaging allows you to remove one battery at a time, keeping your batteries organized while in storage.